I’ve seen a lot of bad code around creating a reusable UITableViewCell in the UITableView data source delegate. So I thought I’d share what I assume to be the right way to reusable table view cells when loading from a nib. The ‘registerNib: forCellReuseIdentifier: ‘ method is the part that is often missing in code snippets on stackoverflow. This has been in the documentation since iOS 5. In fact, it might even make sense to register the nib in the viewDidLoad and forgo the if check all together. This is the largest pain point I face when doing iOS development. “UIViewController is the centre of the iOS world. Apple’s tools like Xcode and Interface Builder, and the workflow they encourage, put the view controller at the centre of everything. The default place to start when you’re adding new code or features is the view controller. When you add a new screen to your app, all you’re given is a UIViewController subclass and a lot of helpful methods to shoot yourself in the foot. Mike Weller’s post is a great explanation of why writing reusable UI code in iOS is very difficult. Let the good times roll. This was one of the marketing taglines Kawasaki’s used in the late 70’s for there motorcycle line. I recently aquired one of these old bikes with the help of a friend. I’ve just started to learn how to ride and it’s been a blast. I’ve decided not to keep the bike in it’s origanal glory, but to have the bike worked over into something new. I love looking through the old marketing ads. The practical, yet adventures choice. Here is an except from one ad. Even small cars are no bargain with today’s traffic jams, parking problems, gas prices and high maintenance costs. So I thought even smaller, and I’m very glad I did. 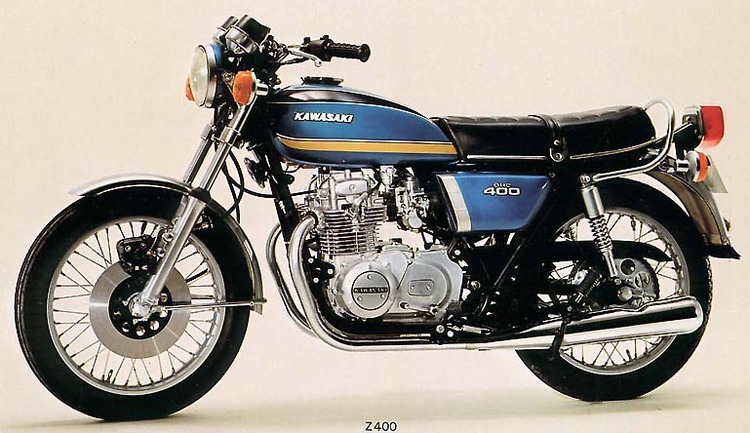 Because that thought led me to the Kawasaki KZ400 Special. It’s a beautiful machine, and a lot of motorcycle for the money. The big 398cc four stroke overhead cam engine puts out plenty of power smoothly and quietly, with no signs of strain. My KZ400 is old and needs more attention than a new bike. But it starts right up without problem. At the moment it has a few idle issues, but over all, she runs great. The modifications being done on her are still a work in progress. It’s too bad the winter is closing in and won’t get as much riding in as I’d like.